Optical technicians are a vital part of the larger health care field. They work with optometrists and ophthalmologists to produce corrective eyewear based on specific criteria. The use of precision equipment is common. Often, the work is completed in a laboratory setting and requires limited interaction with the public. This makes it especially unique among many medical-related professions. In some cases, optical technicians also help in taking patient eye measurements to ensure the lenses will fit properly. They may also educate customers on proper care techniques for their new eyewear and can adjust the fit of frames to suit the individual. In some cases, they may also make repairs to frames that have become damaged or bent. Though working as an optical technician does not have specific educational requirements, completing specialized coursework through a certificate program provides you the knowledge and skills necessary to excel in the field. You will learn to operate key pieces of equipment which can accelerate the progression of your career. Most educational institutions that offer optical technician certificate programs have base requirements for all students pursuing the field. Often, a high school diploma or its equivalent is required to be considered for placement. No additional training is usually required before the beginning of the course. However, you can use your time in high school to better prepare yourself for work in the field. Math skills are particularly valuable in the profession and can make achieving certificate course requirements easier. Science courses are also beneficial, as well as having a solid fundamental understanding of computer or equipment operation. Otherwise, being able to read and write in English is often necessary. While not prerequisites for any program, certain soft skills can also help you be more successful along this career path. Most optical technicians need to be detail oriented, as the slightest variance in a patient’s prescription can lead to less effective corrective eyewear. Organizational skills are also valuable, as well as being familiar with operating a computer. For those working in retail stores of clinics, customer service skills will often be required. Strong communication skills, in person, in writing, and over the phone, are also a necessity. Positions in this field can require a notable amount of manual dexterity. Other physical requirements can include the ability to sit or stand for long periods, depending on the specific environment, as well as the ability to move any equipment in ways that facilitate the completion of specific tasks. While heavy lifting is not involved with all positions, it may be required if handling large supply shipments. Once you complete your high school diploma or its equivalent, you can begin planning your additional education. Class schedules will be dictated by the educational institution you choose to attend. While daytime courses are common, some schools may have night and weekend alternatives available. This can be beneficial if you need to arrange your education around other obligations. It is important to know what scheduling options are available before the beginning of your education so that you can be reasonably certain you will be able to attend. If the institution you select offers financial aid, you will need all required documents and information to complete the forms. For institutions that can accept federal financial aid, you will need to complete the Free Application for Federal Student Aid (FAFSA). The results of your FAFSA will dictate the government programs for which you may qualify. Schools may also offer their own financial aid programs independent of FAFSA results. This can include integrated payment plans as well as institutional scholarships. Further, you may be able to pursue private student loans to cover tuition depending on your eligibility and the educational institution’s availability to accept payment as such. When financial aid is not available, you need to be ready to pay for your courses in full. Each school will have specific deadlines and standards regarding timely payment. Once you have been admitted to an optical technician program, you will need to attend classes to earn your certificate, diploma, or degree. Coursework will cover a variety of skills and knowledge areas to ensure competency in the areas applicable to working as an optical technician. Classes are traditionally available during the day, but many educational institutions also offer evening courses. This gives students the flexibility to choose a schedule that works around their other obligations, such as current employment or personal needs. For those looking for additional flexibility, online programs may also be available. However, clinical practicum requirements still must be met. Often, this involves coordinating with a local facility to receive the hands-on training necessary to complete the work, similar to a traditional externship. In cases where online coursework is preferable, make sure to make arrangements with a facility as soon as possible. Unlike educational labs in a traditional classroom environment that are guaranteed to be available, local clinics, dispensaries, labs, or practices are under no obligation to agree. The amount of time required to complete a relevant optical technician program may vary depending on the school selected. However, many schools offer certificate programs designed to be completed within one year. Other institutions may offer programs that result in the student receiving an Associate of Applied Science degree, which may take closer to two years. In some cases, using only an evening class schedule may extend the amount of time required to complete the program. If that is the case, the school will be able to review this information with you. Students will learn to conduct basic eye exams, as well as how to fit eyeglasses and contacts on patients and customers. An introduction to lens types, including single vision and multifocal, is included along with the techniques necessary to create each type of lens. Classwork reviews the use of soft and rigid contact lenses, as well as the anatomy and physiology of the eye. Fundamentals regarding how to properly read a prescription written by ophthalmologists and optometrists will also be covered. Depending on the educational institution you choose to attend, an externship may be required as part of the optical technician program. During an externship, students have the opportunity to put the skills they learned throughout the program into practice. They will maintain a position in a local facility that allows them to apply their knowledge in a real-world environment. The American Board of Opticianry offers a certification. To qualify, you must pass the National Opticianry Competency Examination (NOCE) and the Contact Lens Registry Examination (CLRE) for the dispensing of glasses and contact lenses respectively. The tests are designed to determine the level of competency of the test-taker, as well as certify subject-matter experts. While the only eligibility requirements are that the person is at least 18 years of age and possess a high school diploma or its equivalent, candidates who have completed an applicable training program or have two to three years of hands-on experience are more likely to be successful. In some cases, state regulations require additional criteria be met before a person can be eligible for the exam. When that occurs, state requirements override the requirements set by the American Board of Opticianry. Exams are completed once per calendar quarter, providing multiple opportunities for those who are interested in becoming certified to take the tests. Interested candidates must register before the exam. The exams themselves are given over a period of two hours. Both exams are completed via computer. The NOCE covers questions related to glasses including the analysis and interpretation of prescriptions, fitting and dispensing of glasses, as well as the use of standard equipment required for the position. The CLRE includes questions regarding proper pre-fitting techniques, as well as preparation and evaluation, diagnostic fit and evaluation techniques, dispensing, patient education, and follow-up care. For those interested in distinguishing themselves further can choose to seek advanced certifications in one or both areas. The examinations cover similar areas as those reviewed in the basic certification exams, but at a deeper level. Additional job experience and education are required before taking the tests. Any eligible person who passes the examinations will receive professional certificates confirming their competency. All basic certifications are valid for three years. During that time, continuing educational requirements must be met before applying for renewal. This process ensures that all certified technicians are aware of the latest industry changes, trends, rules, and regulations. To maintain your certification, all requirements must be met, and the renewal application must be completed, before your current certification expires. If your current certification expires before your recertification requirements are met, you will need to be reinstated. You will still need to produce records regarding your continuing education credits as well as pay a reinstatement fee. As with much of the health care field, the demand for optical technicians is expected to grow at a faster than average rate between 2014 and 2024. As the average age of the population rises, the demand for corrective eyewear will likely expand accordingly. Additionally, anticipated shortfalls in the number of available workers in the field can also keep demand high. Optical technicians may find employment in a variety of workplaces ranging from laboratory settings to retail optometry clinics. The nature of the workplace will significantly impact the job duties assigned to a position. Those working predominately in a laboratory setting often have limited interaction with the public. More time is spent operating precision equipment to produce frames and lenses based on manufacturing specifications. Lenses must be designed to fit specific frames while also holding the correct prescription. While some of these processes are automated, skilled technicians are required to ensure the equipment is operating properly and that the resulting lenses meet the required specifications. To facilitate the work, labs tend to be well-lit and well-ventilated. The environment tends to be very clean, and many only employ a few workers. However, there are large-scale manufacturing laboratories that may have staff numbered in the hundreds. Optical technicians working in retail or clinic settings will likely have more interactions with the public. This can include operating equipment for basic vision screening, assisting with glasses and frame selections and adjustment, and assisting with contact lens fitting and providing care instructions. Some will also have a variety of administrative duties such as patient scheduling and records maintenance. The required dress code will vary depending on the environment. Retail stores and clinics will likely lean towards business casual. Laboratory environments may allow more casual dress but may have additional requirements to ensure safety, such as closed-toe shoes. Safety equipment may be required during the production of lenses. This can include safety goggles, gloves, and masks. Most optical technicians work full time, though part-time opportunities may be available in certain situations. The majority of the work is during the day, but those working in retail environments may also have evening or weekend work requirements. Annual salaries for those working as optical technicians will vary depending on the exact environment as well as the level of education and experience. The median annual salary for those working full time in the classification is near $34,000 per year. However, the top 10 percent can make over $55,000 per year. Those working in retail environments, such as department stores, often make less than those working in optometrist or physician offices, as well as those working in health and personal care stores. Full-time optical technicians will likely have access to a comprehensive benefits package on top of their salary. This can include medical benefits, retirement, and paid time off. In some cases, educational benefits may also be available, as well as discounts for services obtained from the facility in which you work. For those working in department stores, discounts may be available for the store as a whole, or just within the optical services section. Aside from traditional advancement through your optical technician career, you may choose to pursue more education in the areas of optometry and ophthalmology. 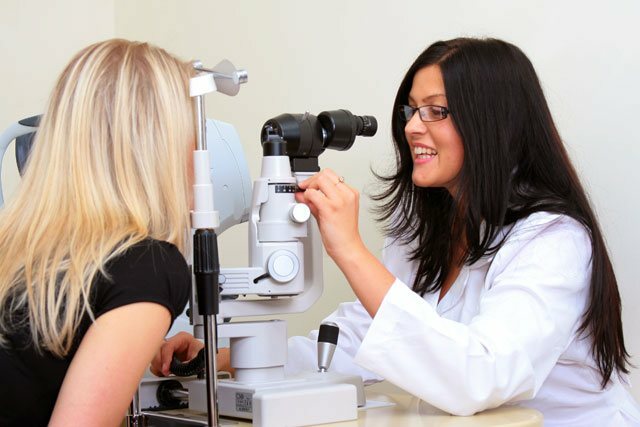 To become a licensed optometrist, most people complete a relevant four-year bachelor’s degree, such as pre-medical or biology, before completing an additional three years of postsecondary education to complete the Doctor of Optometry degree. Additional residency requirements must also be met, as well as the completion of licensing exams. Licensed optometrists can perform vision tests and subsequent analysis to diagnose sight problems and certain eye diseases. They can prescribe visual aids, such as glasses and contacts, and perform certain minor surgical procedures. In some states, an optometrist can prescribe medications, but that is not always the case. Becoming an ophthalmologist requires a bachelor’s degree, followed by four years of medical school, and an additional four or more years of specialized training in the field. Further licensing and board examinations may also be required. Trained ophthalmologists are able to perform standard vision care activities as well as surgical procedures related to eye health and function, and treated associated eye disease in patients. Available subspecialties include, but are not limited to, pediatric ophthalmology, glaucoma, neuro-ophthalmology, and ocular oncology.